Cuervo y Sobrinos presents a special edition, a unique watch, the SUMMER MARATHON chronograph expressly designed for contestants that have to take off… in a split second. To inaugurate sponsorship of the first edition of the “Summer Marathon” vintage auto race that will be held in Bormio from June 14 to 17, 2012, Cuervo y Sobrinos has expressly designed a watch with very sporty features. Its race-timing functions are elegantly combined with a design inspired by the brand’s colors, never lacking that touch of red. 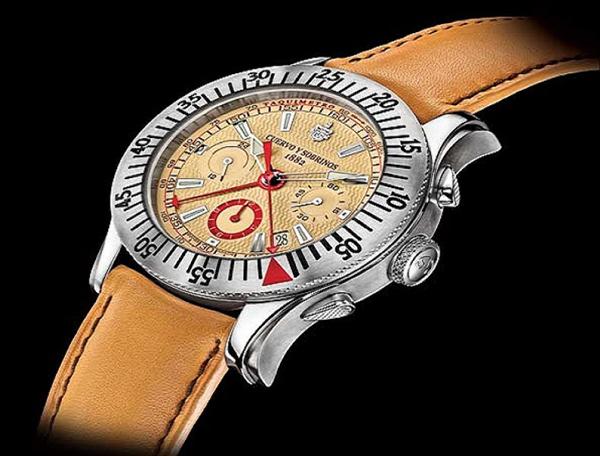 A cream dial and “racing” red second hand, brown leather strap with darker stitching, lined in red. The Robusto SUMMER MARATHON watch is technically in the vanguard and distinctive for an unusual feature especially useful for classic car drivers: a countdown system. The chronograph’s rotating ring-nut shows the countdown in seconds to facilitate race start-up. The red second hand keeps track of the seconds. But it’s above all the details that make these watches unique: the modular case in steel and brushed titanium engraved with the words “SUMMER MARATHON”, the throttle-shaped knurled push-buttons, the honeycomb dial and the crown carrying the Cuervo y Sobrinos logo. The watch will be worn by the official Cuervo y Sobrinos team. In its Italian premiere the watch will be presented in Brescia, at the Mille Miglia Museum, during the Summer Marathon press conference.